A typical full-time student will enroll in 30 credits per academic year, or 15 credits per semester. Check out the many ways that you will save money by studying at Algoma U! 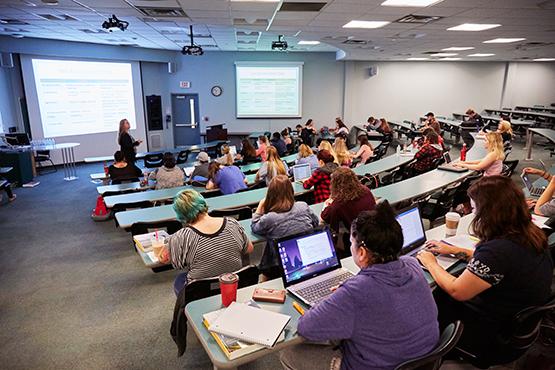 Registration for Fall 2019 and Winter 2020 courses is set to commence on Monday, April 1st. Beginning the Fall 2019 semester, all Ontario universities are implementing the new “Student Choice Initiative” introduced by the Provincial government that provides domestic students an “opt out” option for non-compulsory ancillary fees. Please note, the new “Student Choice Initiative” only applies to domestic students. This government initiative does not apply to international students. Ancillary fees are defined as any fee imposed or administered by a given institution, in addition to regular tuition fees, which a student pays for a service or product. At the point of registration, either online or in-person, domestic students will be given a full list of compulsory and non-compulsory ancillary fees, along with a description of each fee. Domestic students have 24 hours from the point of registration in which to make a final decision to opt out of any non-compulsory fee. The opt-out function is available to domestic students through the Student Portal. After this point, the student will be deemed as having opted-in. Once a student has chosen to “opt-out”, they will not be able to use the services and/or supports provided through the associated fee. If a domestic student has opted out of a non-compulsory fee they will not be able to opt back in for the current semester. They may opt back in for future semesters as long as they do so prior to the posted fee payment deadline. *The undergraduate tuition and fee schedule shown is in effect for May 2019 – April 2020. The Algoma University Board of Governors reserves the right to amend fees after the publication of the Academic Calendar and without further notice. This fee is collected to allow the University to provide fitness and recreation programming to students. The staffing required to implement and support intramurals, fitness classes and other health-related activities are all supported by this fee. This fee is collected to help offset construction costs associated with student spaces on campus. This fee is used to help offset costs associated with student services including tutoring, access to health services, student safety and academic support. This fee is collected to provide students with a full membership to the athletics facility and use of equipment. It also entitles students to have access to open court time. This fee supports the overall operations and enhancements of the George Leach Centre. It will go towards necessary renovations to the GLC Field House and other areas. This fee is collected to allow students to legally make copies of copyright protected materials. Students can copy, fax, scan, store, email or print these material. The Library staff can provide more details as to the specific amount of an article, chapter or book that can be legally copied and shared. This fee is collected as a student contribution to the Varsity Athletic program at Algoma U. With this fee, students are provided free admission to all of the varsity home games. Each student pays this fee to ensure their membership with CFS. This group supports students by offering subsidized handbook production and campaign materials to providing representation and advocacy for social issues, awareness, and changes to the government. They also provide safe and constructive spaces for university and college student unions/associations to collaborate and discuss campus successes and conflicts. If you choose to opt-out of this fee for a given semester, you will not be able to use the services and supports provided by CFS. You may opt back in by paying the fee in subsequent semesters. This fee is collected to provide financial support to all elected and hired members of the AUSU board. By opting-in to this fee, AUSU will be able to provide full-time office hours, supports, and services such as; the planning and running of events and campaigns, bus pass sales, student advocacy, the student health and dental plans, food pantry, and People’s garden etc. to all AUSU members. If you Opt out of this fee, the AUSU staff person, executives, and representatives will not be able to provide full-time office hours and proper support to plan and run all AUSU related events, services, and campaigns. Throughout each semester, a number of events occur on and off campus for students to enhance their overall student experience. These events could include socials such as; pub nights, stress busters, karaoke nights, off campus activities, or campaigns planned by AUSU. This fee allows participation in any event marked as an AUSU event. If you choose to opt-out of this fee for a given semester, you will not be able to participate in these events. You may opt back in by paying the fee in subsequent semesters. This fee is collected to provide opportunities to students who want to create or be part of AUSU recognized clubs on campus. By opting-in to this fee, club members will have the ability to receive annual club funding, apply for club grants. A portion of this fee also goes towards AURA Radio Station which brings you new and engaging content and programming through audio and video mediums. They feature artists, student music, current topics and people to interview. Aura is currently looking for a Coordinator to get the station bumping again. The sentient is our school newspaper that covers sections such as opinion pieces, community news, sports, editorials, fashion and more. This is a good way for students to get involved in media studies and community journalism on campus. If you choose to opt-out of this fee for a given semester, you will not be able to be a member of a recognized AUSU club. Additionally, you will not be given the opportunity to receive club funding and printing services. You may opt back in by paying the fee in subsequent semesters. The Shingwauk Anishinaabe Students’ Association supports the academic and cultural needs of the Indigenous students and offers cultural activities for all students and the Algoma U community. SASA will hire support staff for students on campus. The SASA executive provides advocacy and student voice throughout numerous administrative committees and leadership tables. If you choose to opt out of this fee, the Shingwauk Anishinaabe Students’ Association run the risk of not being able to provide an acceptable standard of services to students and there would be a reduction of services offered by SASA. There would be a reduction of administrative support that would be available to the Shingwauk Anishinaabe Students Association and students. Throughout the year SASA hosts numerous cultural workshops, potlucks, feasts, seasonal events and Anishinaabe speakers. These events are intended to both provide support and opportunity to students to access cultural services and enhance student experience. If you choose to Opt-out of this fee, there would be a significant reduction of events offered throughout the school year that are geared towards student well-being, success and experience. Throughout each semester, a number of events occur on and off campus for students to enhance their overall student experience. These events could include social events planned by student experience, co-curricular educational events, and off campus excursions. This fee allows participation in any event marked as a Student Experience event. Payment of this fee will allow you free participation in those events. You will not be charged an additional fee. This fee is collected to help offset the costs of the student refugee program, which allows a refugee to attend our institution and covers their cost of attending. If you choose to opt-out of this fee for a given semester, you will not be able to participate in WUSC related events. You may opt back in by paying the fee in subsequent semesters. All international students and their dependents must enroll in the University Health Insurance Plan (UHIP), or a similar approved plan, for health coverage. The premium cost for a single student is $624 for the period from September 1 to August 31. This fee is subject to change upon evaluation of the program. International students will not be permitted to register until and unless they have enrolled in UHIP or provided documented proof of membership in another similar plan. Please consult the Office of the Registrar for further information. *The undergraduate tuition schedule is for the May 2018 to April 2019 academic year. All other applicable fees are for the May 2019 – April 2020 academic year. The Algoma University Board of Governors reserves the right to amend fees after the publication of the Academic Calendar and without further notice. To make education even more affordable, we’re offering tuition to American citizens at domestic rates! That means you, our American neighbor, pay exactly what we Canadians do! Where else are you going to find a deal like that? Fees are identical to Canadian student fees, with the exception of an additional $25 per credit International Student Recovery Fee (ISR). All US students and their dependents must enroll in the University Health Insurance Plan (UHIP), or a similar approved plan, for health coverage. The premium cost for a single student is $624 for the period from September 1 to August 31. This fee is subject to change upon evaluation of the program. US students will not be permitted to register until and unless they have enrolled in UHIP or provided documented proof of membership in another similar plan. Please consult the Office of the Registrar for further information. Senior citizens are not eligible to join the George Leach Centre as students, but may join as community members. For information on how to apply as a senior, visit our Apply section. *The undergraduate tuition and fee schedule shown is in effect for May 2019 – April 2020. The Algoma University Board of Governors reserves the right to amend fees after the publication of the Academic Calendar and without further notice. Tuition for the 202-21 academic year will be available in May 2020. *The Postgraduate Certificate Program tuition fee schedule is for the May 2018 to April 2019 academic year. All other applicable fees are for the May 2019 – April 2020 academic year. The Algoma University Board of Governors reserves the right to amend fees after the publication of the Academic Calendar and without further notice. The Off-site Ancillary Fee applies to courses not offered on the Sault Ste. Marie, Ontario campus. Parking is permitted in designated areas only. All students, visitors and staff must park their vehicles in the main parking lot. There are spaces provided in the upper lot for those with handicap permits. No parking is permitted on roadways or driveways and unauthorized parking could result in the vehicle being ticketed or towed away at the owner’s expense. Bicycles, while exempt from parking fees, must be parked in the bicycle racks provided on campus. Parking cards can be purchased for each semester or for the entire year at the Cashier’s Counter in the Main office (Room SH 312). Fees are $100 per semester. Please note that fees are subject to change. Daily users will be subject to a $5 parking fee upon each exit. Selected courses in Biology, Chemistry, Film Studies, Physics, and Visual Arts will be assessed a Laboratory and/or Studio Fee. Laboratory courses will be charged an additional $20.80 per 3-credit course, and studio courses will be charged an additional $15.60 per 3-credit course. In some cases there may be courses where an additional fee is charged for field trip expenses. This fee will be assessed when registered. Registration in COOP 0101 and in COOP work terms, the fee is equivalent to 1.0 credit tuition fee. Students who are taking 12, 15 or 18 credits in a semester must be covered by the health insurance plan provided by the Algoma University Students’ Union (AUSU) at a rate of $310 per year. Students who have registered in full-time courses and have comparable coverage may opt out during the designated opt-out period found on the AUSU Student VIP website. You may only opt out during the semester opt-out dates that were set when you began full time. Students who are part time and registered with the learning center may be eligible to be enrolled on the plan. For more information, contact the AUSU office at 705-949-2301 ext. 4719.